This book is on sale on Amazon for $0.99 (regularly $3.50) 7/1/2018 - 8/1/2018! Award-winning author Claudette Melanson offers eleven new and original stories to make your skin crawl at any time of the year. This horror anthology also includes an original short by Amazon International Best-Selling Author, Lynn Lamb, titled "Bring Me Flesh and Bring Me Wine." A special bonus story is also included by Melanson, "Mislead," previously published only on the Halloweenpalooza blog. 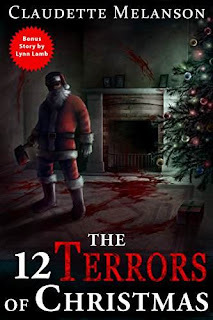 Grab a cup of cocoa and make sure the windows and doors are locked tight as you settle in by the fire to enjoy these tales of terror, but be warned...locks have never succeeded at keeping Santa from gaining entry. If you enjoy a slice of horror with your holiday cheer, this collection of Christmas horror shorts will satisfy all your dark cravings during the holidays...and beyond.